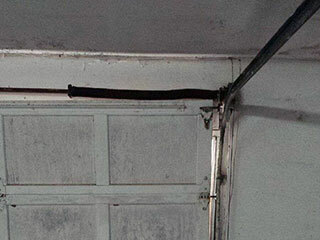 Garage Door Spring About To Break? When a spring breaks, you can hear a loud bang resonating from inside your garage. Your immediate instinct might be to rush over and check if your door can still open and close, but that would be a mistake. While you should go and see that no one has been injured, you should never try to open or close your door while one of its spring is broken. Instead, you need to contact our team as soon as possible. It takes more than just a little effort and will to safely replace a broken spring. These components are in charge of supporting the weight of your door, and therefore they are under a lot of tension on a regular basis. That means that any mishandling could result in the door getting off track and collapsing, not to mention a serious injury to any person involved. Special tools, as well as experience and training is required in order to perform the spring replacement procedure safely. That's what we're here for. In order to avoid a lot of potential accidents, and to increase the working lifespan of your springs, regular maintenance is required. Our professional technicians can adjust the weight and tension distribution of these components to make sure their condition stays optimal, as well as apply them with the right lubricant to ensure their operation remains smooth and efficient. If at any point we discover that your springs have suffer too much wear and tear and are no longer able to function properly, we'll replace them on the spot to prevent them from breaking unexpectedly. No matter what type of spring related problem you're experiencing, our experts at Garage Door Repair Plainfield will be able to help you out. Call us today.